Get started writing for magazines, and learn to make a living at it. Through examples, explanations and tips, Writing Articles About the World Around You demonstrates how to generate original and saleable article ideas using information that is part of your everyday life. Even if you live in Nowheresville, you'll learn how to recognize topics and angles that can interest editors at magazines and newspapers. * Use your experience, on-the-job knowledge and everyday life to develop how-to articles, reviews and opinion pieces * Create interest in ordinary or unusual topics using the elements of timeliness, curiosity, empathy and entertainment value * Highlight people you know or you can easily track down in fascinating profiles, Q&As and roundups * Write travel features about nearby places that you probably take for granted * Master the mechanics of good article writing, including the article structure editors expect and readable prose * Target the right publications for your work with persuasive query letters * Understand the key issues to discuss with your editor - deadline, angle, length, payment, kill fee and publishing rights * Decide whether you want to build a fun sideline to what you currently do or a new full-time career as a freelance writer. 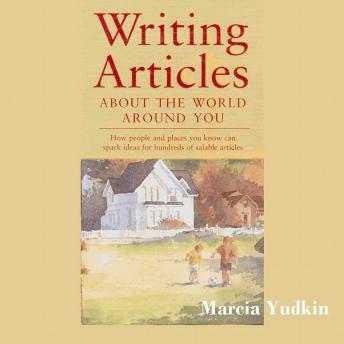 Author Marcia Yudkin entertains and teaches you with her experiences writing for local and national magazines as well as the insights of dozens of successful writing-from-home freelancers involved in everything from riding, gardening and home repair to business, aviation and the arts.